For the fourth year in a row, North Carolina A&T and North Carolina Central’s rivalry will play into the MEAC title picture. North Carolina A&T and North Carolina Central have been rivals since the two programs first started competing against each other on the football field back in the 1920s. The rivalry has always been fierce, but the last few years, the stakes have been high. From 2014 through 2016, every game has been a factor in the MEAC championship race. The 2014 game ended up as a 24-21 win for NCCU, paving the way for an epic five-way tie for the title that included both teams as well as Morgan State, South Carolina State and Bethune-Cookman. Tarik Cohen and Kwashaun Quick in 2015. NCCU QB Malcolm Bell celebrates 2016 win at home. Khalil Stinson prepares for 2016 matchup. North Carolina A&T’s Golden Delight in 2016. Malcolm Bell celebrates at Aggie Stadium. Ryan Smith and his teammates celebrate at Aggie Stadium. Tarik Cohen runs past NCCU defenders in 2015. Ryan Smith in his last game for NCCU. The setting shifted to Greensboro in 2015, but the results were the same with NCCU stopping A&T’s bid for a solo title. NCCU won that game 21-16, but A&T would go on to win the inaugural Celebration Bowl a few weeks later in Atlanta. After those two high-powered matchups, the teams met back in Durham in 2016. Both teams entered the game nationally ranked and knowing that a win would result in an outright title and a berth in the Celebration Bowl. And once again, NCCU emerged the victor, and it wasn’t even close as NCCU won 42-21. This season’s game won’t decide the Celebration Bowl, but there is plenty on the line. 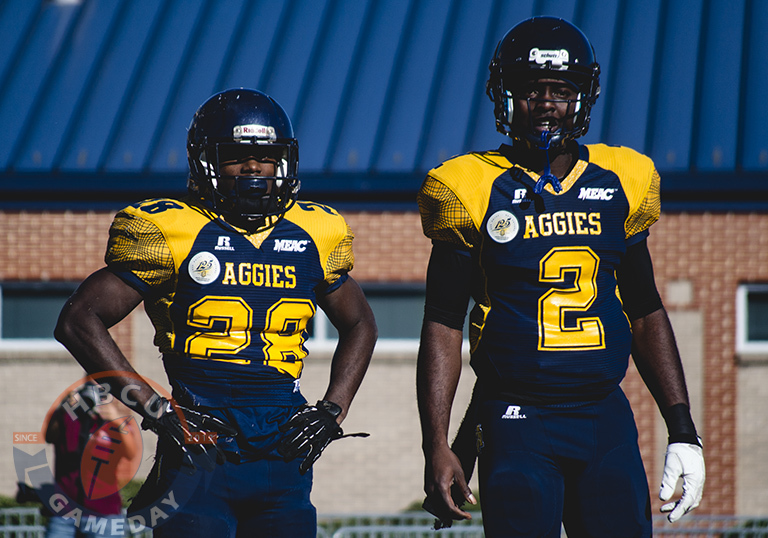 A&T is currently unbeaten, and a win would not only keep that alive, but give it the outright MEAC title for the first time in a decade-and-a-half. For NCCU it would be a satisfying end to a season that ends up just short of where it wanted to be. And Howard will be in its corner, as an A&T loss and a Howard win over rival Hampton would give it a share of the MEAC title. We’ll have all the coverage from Greensboro, so be sure to follow us on Twitter for the latest.